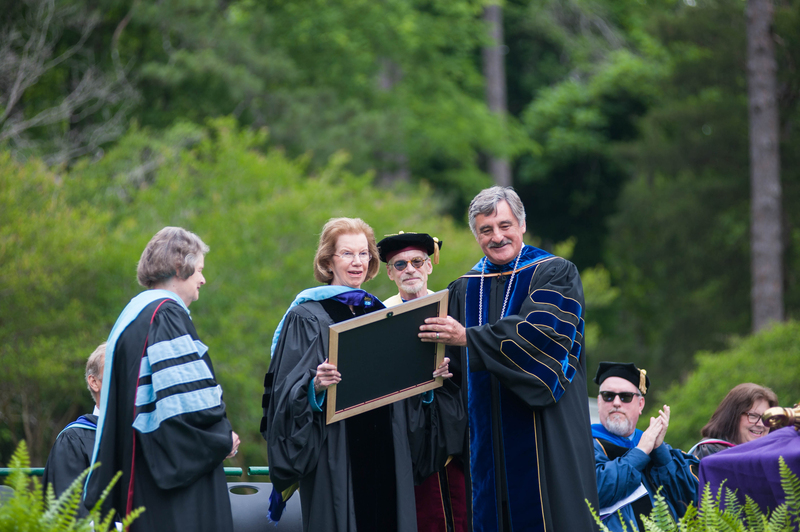 Trustee Libby Queen, Provost James McDonald and President John W. Stewart III recognize Barranger at Spring Commencement. 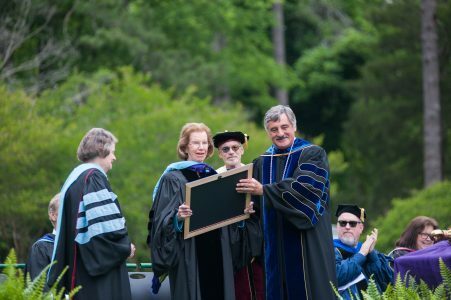 During the Spring Commencement ceremony held May 5 on Flowerhill, the University of Montevallo presented alumna Dr. Milly Slater Barranger ’58 with an honorary doctorate degree for her achievements. Barranger, an author, educator and producer in New York City, writes books about women and the modern American theater. A Birmingham native, Barranger studied at the University of Montevallo to earn a Bachelor of Arts degree in English and secondary education. She also minored in French. During her time at Montevallo, Barranger served as president of student senate, Gold Side cabinet member, president of the English club, president of the college theatre organization and writer for The Alabamian. She was also recognized with such honors as Senior Elite, Who’s Who in American Colleges and Universities and several honor societies. After graduating from Montevallo in 1958, Barranger went on to earn a master’s degree and doctorate degree from Tulane University. In 1971, she was named chair of the department of theater at Tulane, which she led for nearly a decade. She married G.K. Barranger, and has one daughter, Heather Dalton Barranger Case. Barranger went on to work as professor and chair of dramatic art at the University of North Carolina at Chapel Hill. At UNC, she was also the illustrious leader of the resident theater company PlayMakers, which is still in operation. During this time, she also became scholar-in-residence at the Yale School of Drama. In 2017, she was named a Lifetime Achiever by Marquis Who’s Who for her accomplishments and prominence as a theater professional. Also in 2017, she was selected to serve a three-year term on the Tony Awards Nominating Committee.